← I don’t tailor my c.v. or cover letter much, since there are usually fairly detailed online applications you have to fill out. I’m happy to provide this two-part informal summary of research by Lori Smith and Penny Hecker on a topic which may be of great interest to you current and aspiring academic librarians. In this post, Smith and Hecker offer a look at the tenure process within the University of Louisiana system, and their personal reflections. Next week, they’ll broaden this information by providing resources on librarians’ tenure across the US. In order to simplify the research they agreed to focus on the libraries within their own University of Louisiana System, rather than looking at all the academic libraries in the state. The article “Tenure and Promotion: Criteria and Procedures Used by University of Louisiana System Libraries” appeared in Volume 2, Issue 2 (2012) of Codex: Journal of the Louisiana Chapter of the ACRL: http://journal.acrlla.org/index.php/codex/article/view/71. Though it did take quite a while to do it, writing the article was actually quite interesting. The first challenge was obtaining copies of the tenure and promotion policies for the libraries in the University of Louisiana System (ULS). (The library at McNeese University was the only one that didn’t have its own policy.) While the university policies were often available online, none of the library policies were. Fortunately, through my connection with the government documents librarians across the state and the help of some colleagues who used their connections, we were able to get copies of the policies we needed. The similarities between the policies were clear in that all evaluated job performance, research/professional activity, and service, but significant procedural variations did arise. Some libraries did tenure and promotion reviews in the fall, and others in the spring. The University of New Orleans, which had just recently been moved into the ULS, had deadlines for both fall and spring reviews. Some libraries used all tenured faculty at or above the rank being applied for as the peer review committee, and others used a smaller number of members. The required contents of the review portfolio also differed slightly from library to library. Southeastern seems to be the only institution that requires all job descriptions from the probationary period to be included in the file. Since colleagues aren’t always familiar with each other’s duties, this is a useful addition to the file. The weighting of the three areas being evaluated varied widely. In most cases, job performance was weighted most heavily, followed by research/professional activity, and then service. The only university that weighted service more heavily than research/professional activity was Grambling. Given the amount of time that librarians at Southeastern spend on committee work for the Library and University, it may be that Grambling has the right idea. There was very little detail in the policies about the requirement to “publish or perish.” Various types of publications were mentioned along with other typical accomplishments within research/professional activity, but rarely was a specific number of publications mentioned. For early promotion the policy of Nicholls State required a specific number of “scholarly works,” which topped out at three for promotion to Full Professor. Southeastern’s policy mentioned that two “publications” were required to achieve a rating of “Excellence” in professional activity, and that a “substantial record of publication” was required for promotion to Full Professor. None of the policies specified that publications had to be based on empirical research, though many included language (“outstanding,” “distinguished,” etc.) that emphasized the quality of the works. 3) other relevant topics for future research might be faculty opinions about the process and the effect mentoring has on the process. First, I want to note how helpful Lori’s mentoring was to me in the process. It’s common in our profession to have librarians mentoring new colleagues; it’s almost a necessity when climbing the mountain of tenure and promotion. And that’s what it felt like after I completed the process and earned tenure and promotion: like I had just scaled the academic equivalent of Mount Everest for 6 years. I was awarded tenure in 2013 and promoted from Assistant Professor to Associate Professor. My experience of tenure was closer to the traditional experience of tenure-seeking teaching faculty because I teach credit-bearing term courses in library research to undergraduates. Thus my tenure file, like non-library teaching faculty had to include documentation of peer teaching observations, student opinion of teaching, grade distributions, course content examples, research, publication, and service duties. The aforementioned was in addition to my scheduled daily duties of desk reference and virtual reference. However, I had to jump through the hoops of tenure as a 12-month employee of the university, unlike non-library tenure-track faculty who are usually contracted to work 9-10 months, allowing them the summer to work on necessary activity toward tenure. Thankfully, our library slows down somewhat in summer so the pace is more amenable toward achieving at least some of your tenure goals. If you think that you want a tenure-track position in an academic library, consider whether or not you will be required to teach credit courses and whether your appointment will be 12 months or 9-10 months. Although the rewards of teaching can be many, there are also many unknowns in dealing with students. These unknowns may affect how much time and energy you have left over to do research, committee work, publishing, and professional activity. I was awarded tenure in 1996. At that point Sims Library had only one tenured faculty member and no written policies on tenure and promotion. We followed the overall university policy, and, since peer review committees were required to have at least three members, I had to recommend faculty from outside the Library to serve on my committee. I don’t teach any credit-bearing classes, so it was nerve-wracking trying to explain and document my duties thoroughly enough for non-librarians to understand and appreciate what I had accomplished. Since the committee awarded me tenure but refused my request for promotion from Assistant to Associate Professor, I probably could have done a better job. In any case, shortly after I was tenured I served on a Library committee that drafted tenure and promotion guidelines for the Library. We wanted to ensure that librarians in the future would know what was expected from them and that outside reviewers, when necessary, would have an overview of what the Library considered to be superior performance. The guidelines have been revised many times over the past several years, but I think they’re an invaluable tool for everyone involved in the process. I certainly wish I’d had them when I was starting out. To end on a positive note, I did eventually get promoted to Associate Professor and as of this year, I’m well on my way to being promoted to Full Professor. With sufficient guidance, it is indeed possible to climb to the top of the ladder. Lori L. Smith obtained her M.L.S. from Indiana University in 1987, spent a few years as a Government Information Specialist at the St. Louis Public Library, and has been the Government Information Librarian at Southeastern Louisiana University since 1991. 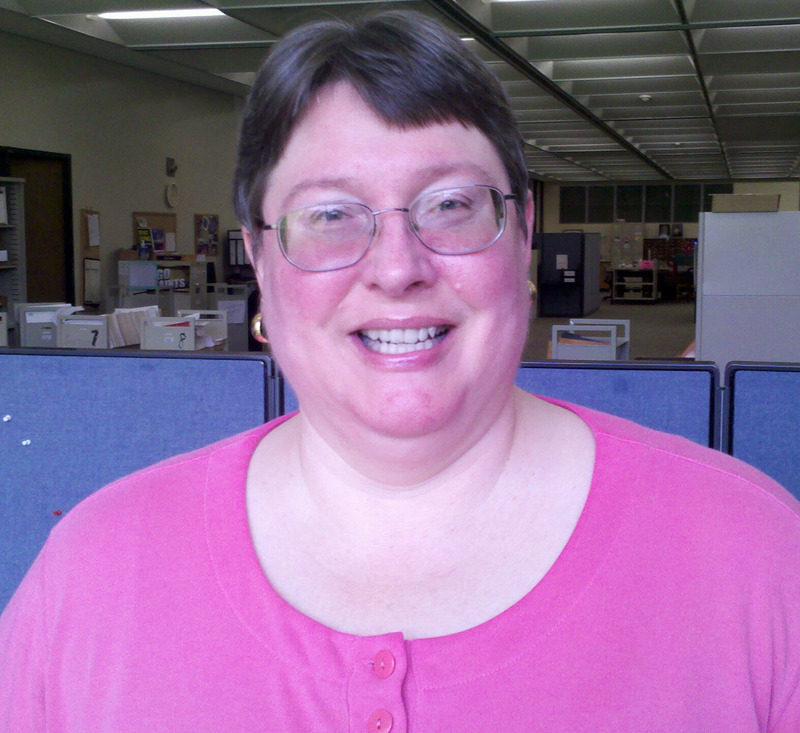 Penny Hecker has worked in both public and academic libraries since 1991. She is currently a reference/instruction librarian and Associate Professor at Sims Library, Southeastern Louisiana University, where she teaches the credit course Library Science 102.